Hello, when I try and print this Baby Dedication certificate it actually prints one of the others ones instead. I would like to have this specific one if that’s possible? Thanks for stopping by here on Temploola! Unfortunately the button was linked to the wrong document, but I’ve fixed it now. You can download the right zip-file now! Want to dedicate your baby to the Lord and want to have it written down on a certificate? 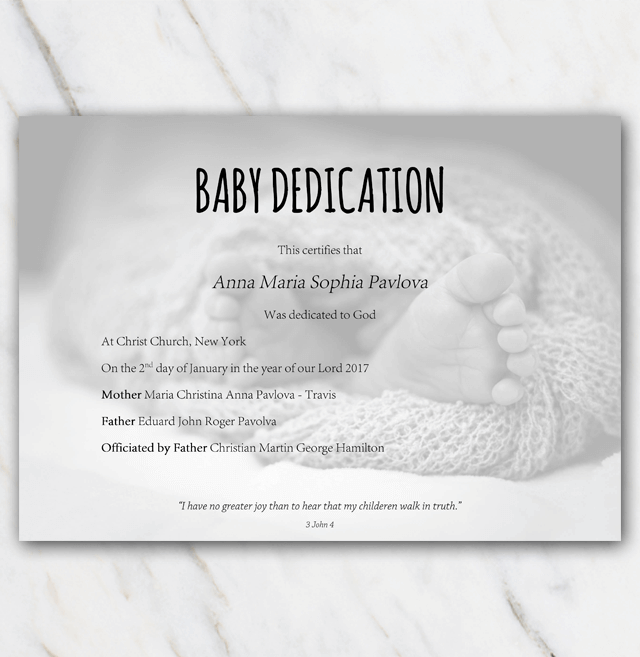 Check out this lovely baby dedication certificate template. You can download the zip-file for free, install the fonts and modify to your own wishes. Looking for another style? Have a look at my other baby dedication certificates templates.